July 21, 2015 – DKI, North America’s largest disaster restoration contracting organization, announced today that one of its Member Companies, K-tech Kleening Systems of Weston, Wis. sponsored a Burn House event to provide CE training for local insurance agents and adjusters. The event was held on July 16 and 17 by the Wausau Fire Department and EFI Global. 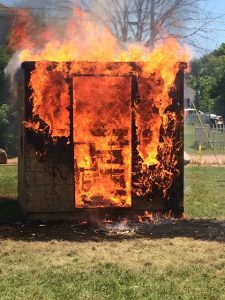 K-tech Kleening partnered with the organizations to help provide lunch for the attendees, as well as providing an 8×8 burn cell and countertop to demonstrate appliance and flash fires. The burn cell was furnished with suitcase, sofa cushions, clothing and carpeting to show a flashover situation, while they used an unoccupied two-story house, donated by the city to stage additional burn scenarios in each room. Agents and adjusters went through the house to determine the root cause of the fire, then they converged in a tent (classroom) to watch the video of the actual burns scenarios. Those who passed the test were awarded CE credits. An estimated 150 people attended the two day training event.